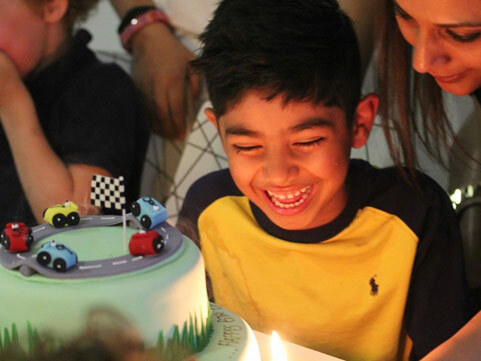 A celebration at Race Party is a birthday event like no other! Race on one of our two 40 metre, eight lane slot car race tracks. Battle it on the track with your friends before heading into our function rooms to continue the party with great food and drink packages. Ideal for boy & girls; school going children 6 years and older. 90 minute events available on both Weekdays and Weekends. All Race Party birthday bookings have a minimum of 10 (UV and Disco parties 14) and a maximum of 24 children. We offer two packages: Pit Lane or Pole Position with the option of a UV or Disco add on. Book a package below or call us on 03 9882 1391 for your child's next party. 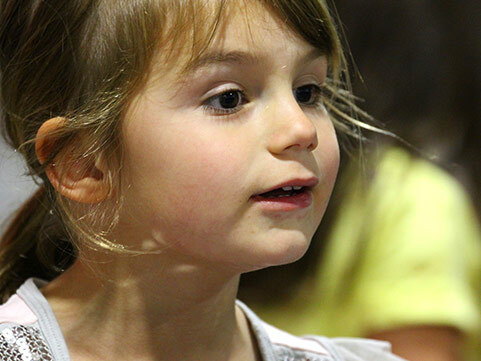 Enjoy 60 minutes of track time and race events with a dedicated party host for up to 24 children. Take your Pit Lane Package to the dance floor with a Disco Racing event. Our Monaco track room transforms into full party mode. Disco Racing mixes the hottest slot car action with the ultimate in party function venues. You are the DJ as you choose your playlist from the greatest party anthems. Lighting effects such as mirror balls and disco lights. 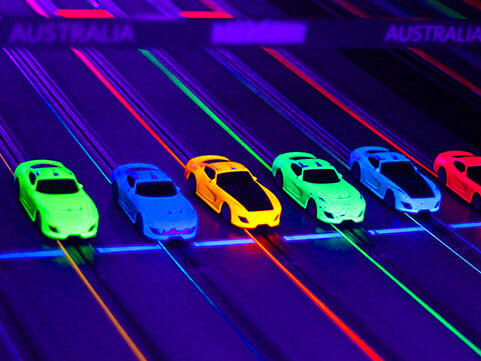 Race Party’s Kids UV Racing mixes the fast paced action and excitement of slot car racing with glow in the dark lighting and visual effects. Complete with a high intensity soundtrack, feel the energy as you race around the neon coloured track with UV reactive cars, track and room art glowing under the ultra violet lights. Each child receives a "Glow Band" to wear during the event. Take your Pole Position Package to the dance floor with a Disco Racing event. Our Monaco track room transforms into full party mode. Disco Racing mixes the hottest slot car action with the ultimate in party function venues. 1-2 parents or guardians should remain with the group and while other adults and family members are welcome to stay, space can become very limited in both the Track and Party rooms. Your cooperation is greatly appreciated here. Children need to be at least 6 years of age to be a guest at a Race Party and 8 years of age for a UV Racing party.